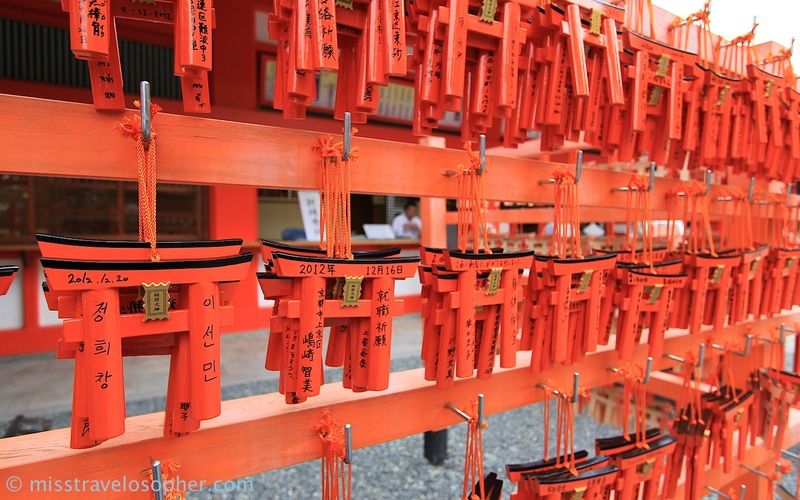 Shinto is the indigenious religion of Japan and the jinja, or shrine is where believers will go and worship. 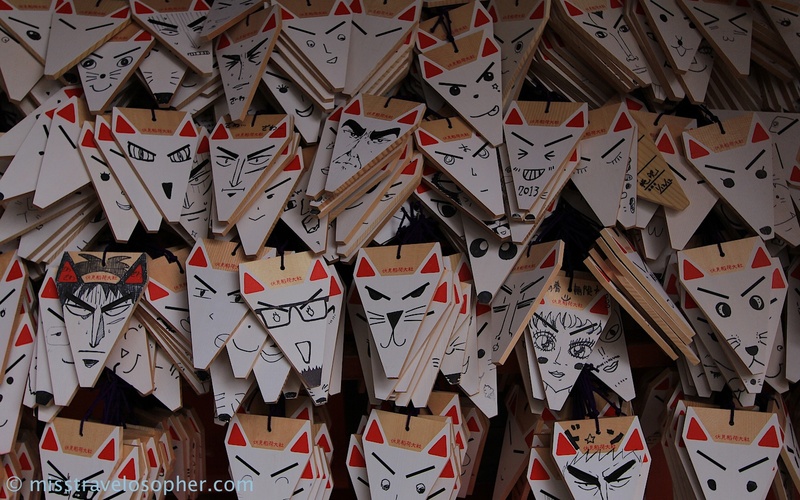 Visiting a Japanese Shinto shrine is one of the things which should not be missed when travelling in Japan. There is an estimated 100,000 Shinto shrines in Japan and some of them are famous and historically significant to the Japanese culture. Shinto ‘gods’ are known as kami. 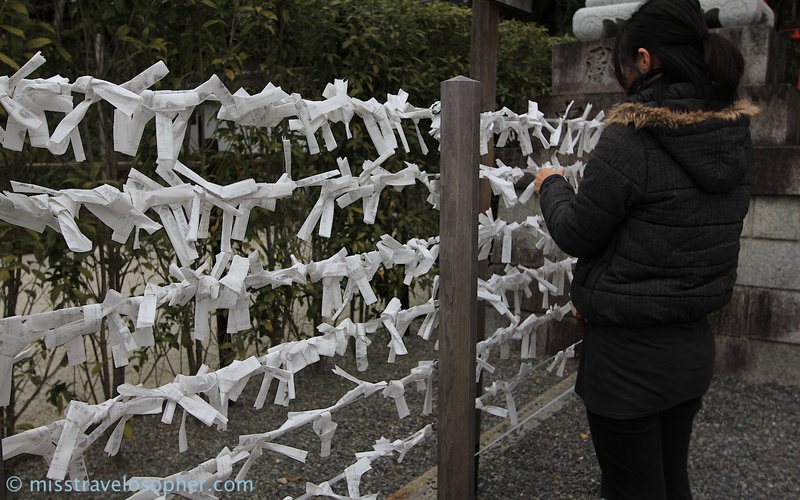 People visit shrines to pray for good fortune, as well as to pay respects to the kami. 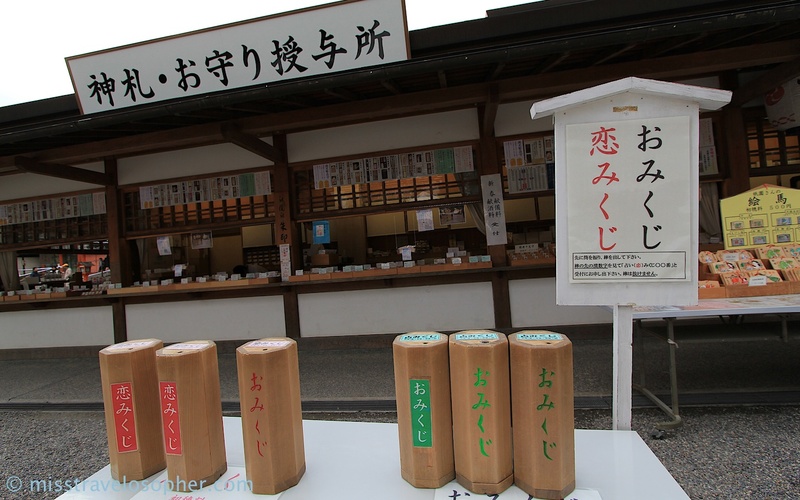 A shrine visit is also culturally significant on special festivals such as New Year, marriage, setsubun amongst others. 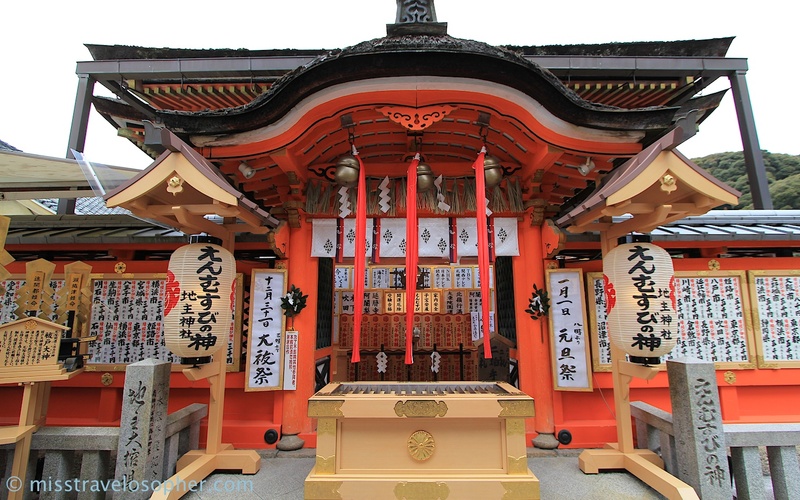 As a visit to Japan is never complete without visiting some of the Shinto shrines, it is advisable to be educated on some of the etiquette involved when visiting shrines. 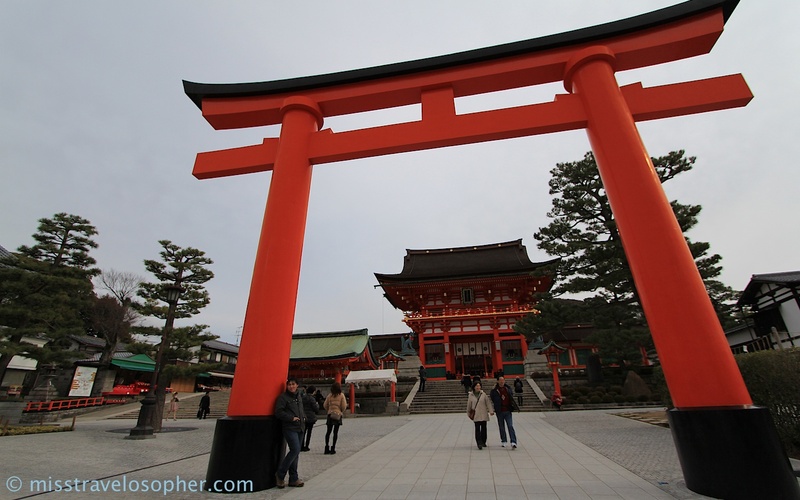 The bright vermillion torii gate marks the entrance to the Shinto shrine. 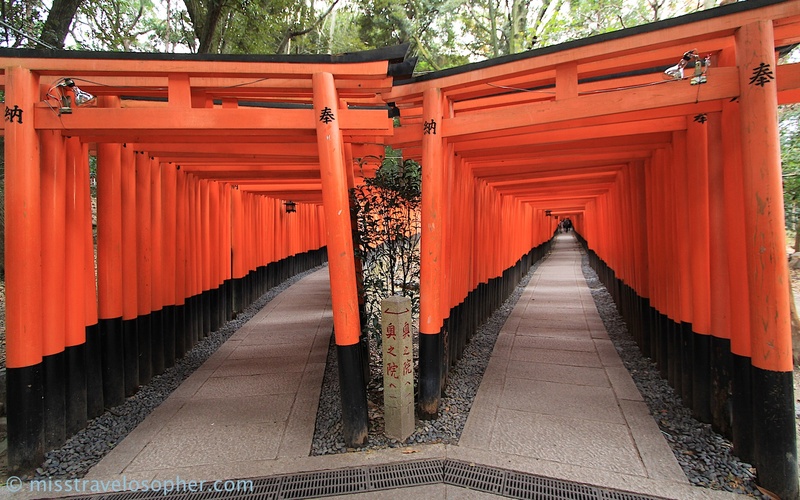 Most torii gates are made of wood and painted like the above. There are also some torii gates which are constructed using cement or stone. 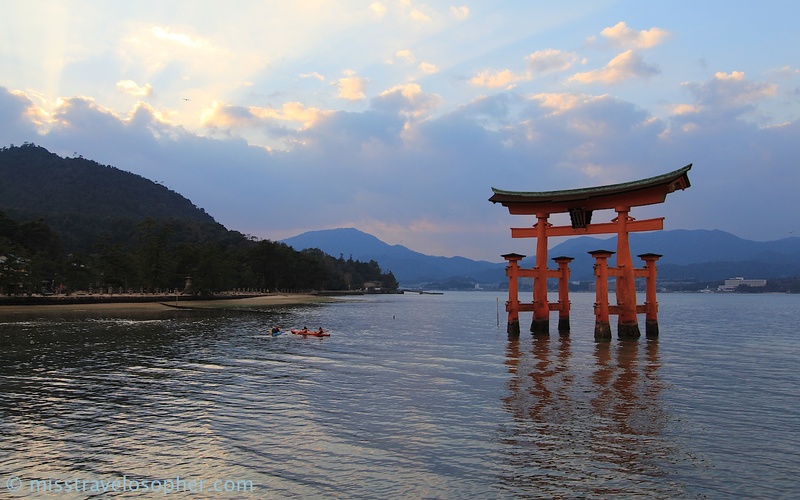 One of the most spectacular torii gates belong to Itsukushima Shrine at Miyajima – at high tide, the torii gate seemingly floats on the sea and it is one of the 3 most scenic views of Japan. 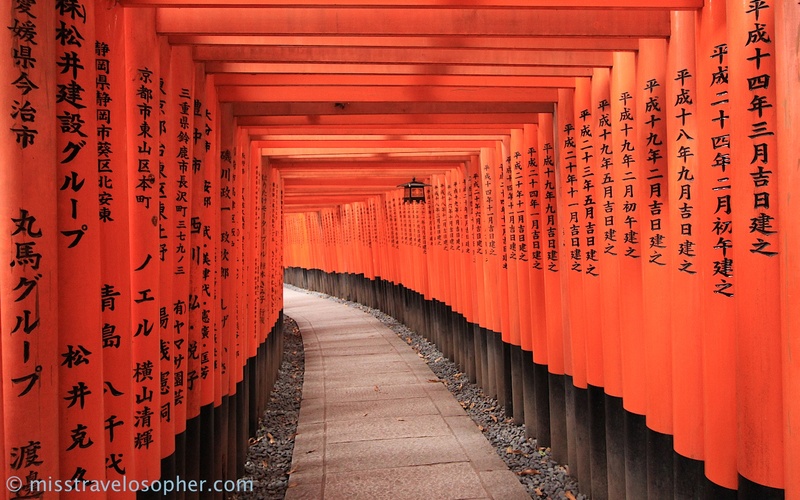 Another of my favorite torii gates will have to be the endless toriis at Fushimi Inari Taisha in Kyoto. Here, thousands of torii gates snake up the mountain forming a spectacular view. 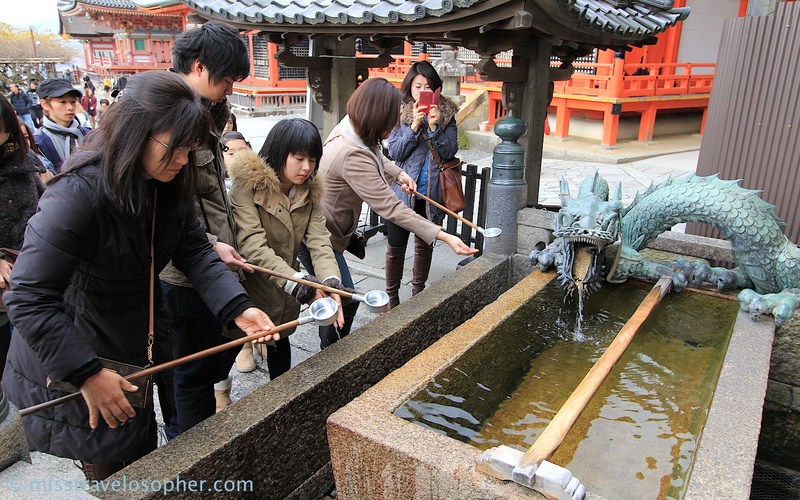 Near the entrance of the shrine, you will see a purification trough where the water from the fountain is meant to be used for purifying oneself prior to entering the main shrine hall. 1. Scoop water from the fountain or trough using the ladle. Holding the ladle with your right hand, pour some water onto your left hand and rinse. 2. Pass the ladle to your left hand, pour some water on your right hand and rinse. 3. Pass the ladle back to your right hand, and cup your left hand. Pour some water into your cupped left hand and use it to rinse your mouth or use the water to dab the lips (I usually practice the latter). Note: Do not touch the ladle with our lips/mouth directly. 4. Empty the remaining water from the ladle and place the ladle back. 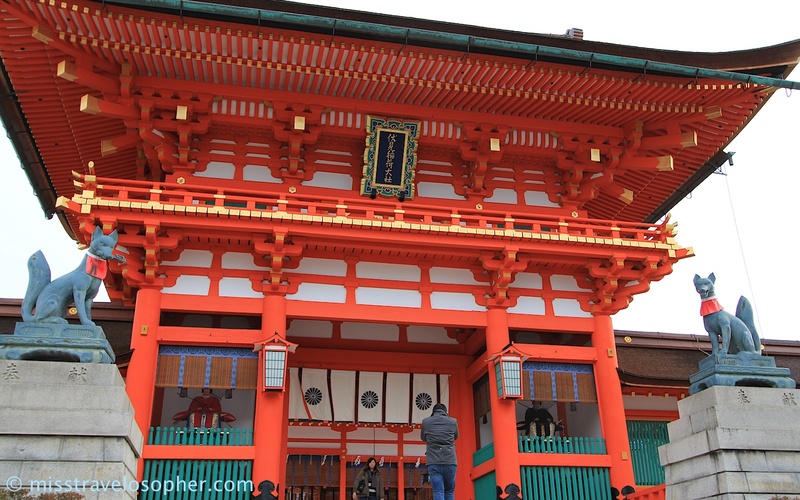 After you have passed the entrance and enter the shrine proper, you will be likely seeing the main hall of the shrine. 1. Bow gently and pull the rope to sound the bell. This is like a notification to the kami that you have arrived. 2. Put some coins into the offertory box. 3. Bow twice, clap twice and make a wish as you like with your hands joined together in front of the chest. 4. Bow again when you are done. Thereafter, feel free to roam around and explore the beautiful architecture of the shrine buildings and beautifully trimmed gardens of the shrine grounds. 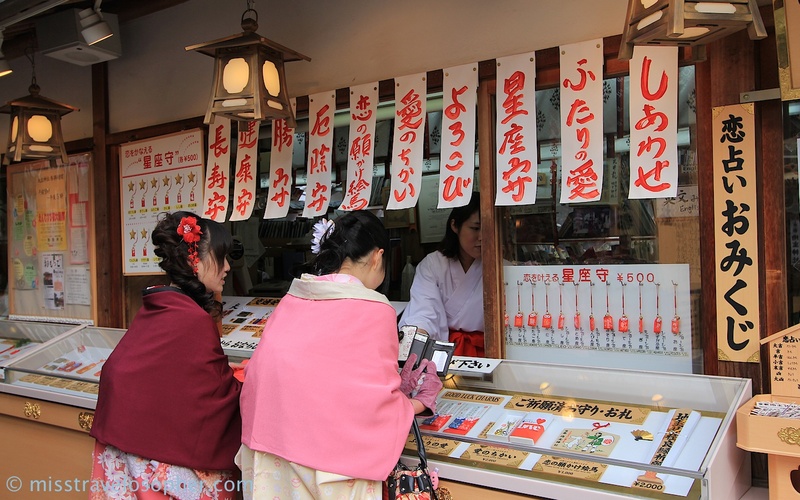 It is also worth noting that there are shops in the shrines which sell all sorts of lucky charms and amulets (omamori), fortune telling paper slips (omikuji), and wooden plaques (ema) for you to write your wishes. 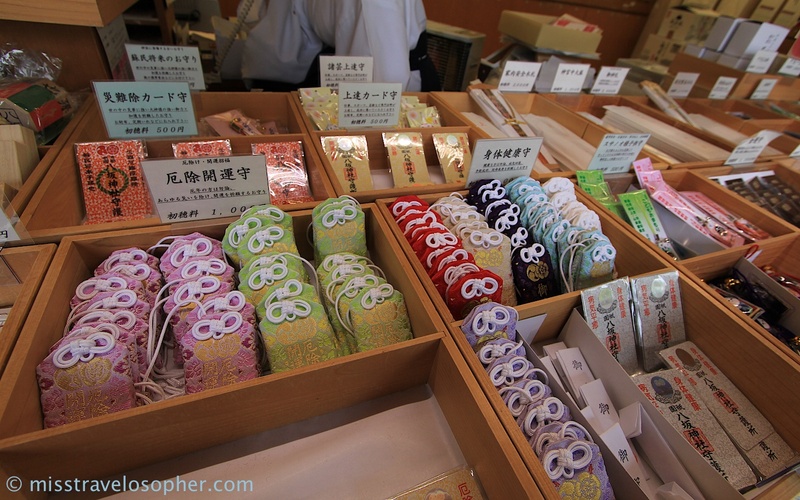 Personally, I love collecting omamori from different shrines as I find that the embroidery on the pouches are so intricate. 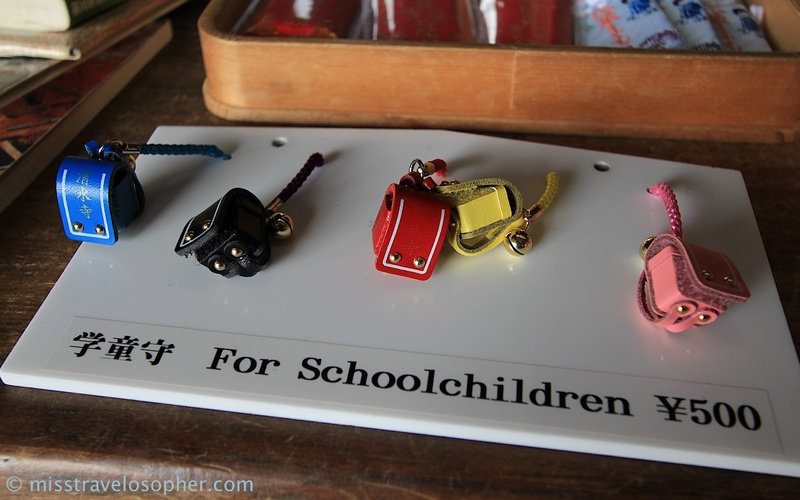 There are different omamori for different purposes such as love luck, good fortune, good health, success at work or studies etc. 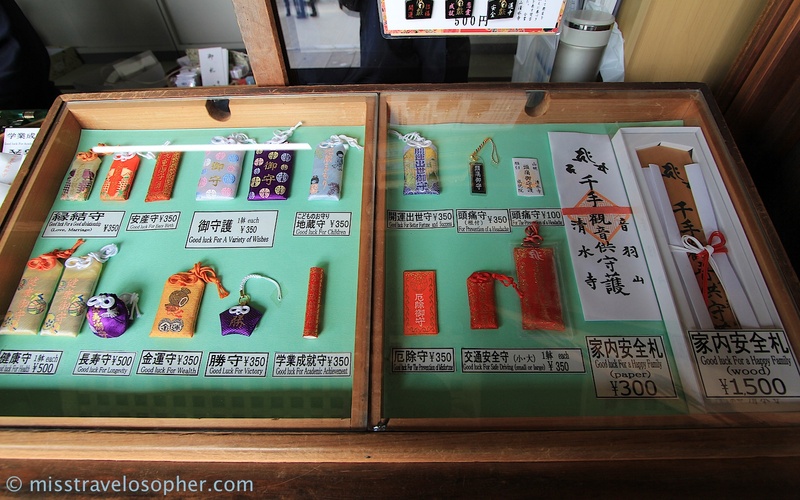 Some shrines offer omikuji (fortune telling slips) in English. For the fun of it, try buying one! However do note that if you bought an omikuji, you will have to fold it up and tie it on a post when you are done reading it. 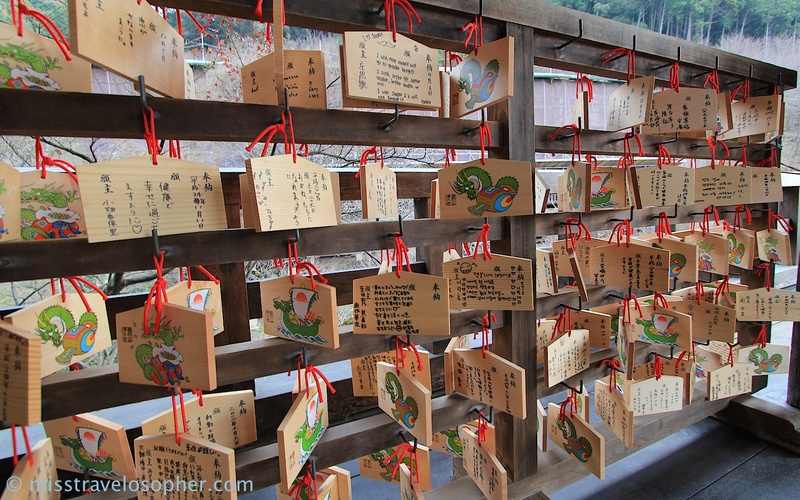 Wooden plaques known as ema are also available for believers to pen down their wishes. 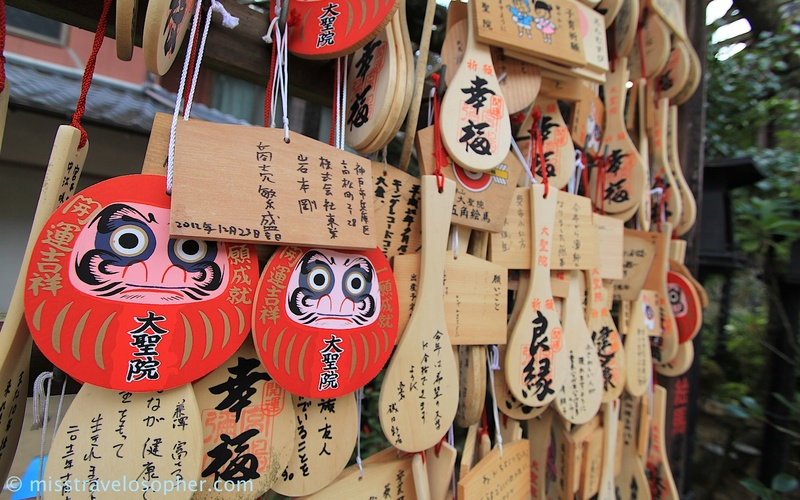 I’ve come across quite a few interesting ema plaques from different shrines across Japan. That’s all from me for now! If you visit a shrine in Japan, do try out the things mentioned above if you don’t mind 🙂 I find that travelling is all about experiencing the other country’s culture. Feel it, breathe it and enjoy it! Japan is an amazing country. There are a lot of traditions in their culture. People are responsible for saving them. Love this country. Best regards!